As I talk to clients and learn what they’re most worried about as we step into 2019, the drive for innovation, creativity, and employee engagement top the list. 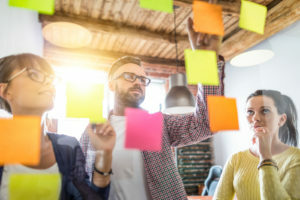 Using a Design Thinking approach is a great way to address each of these areas of focus, I have outlined a few questions below to give you a head start if you’re thinking about utilizing Design Thinking to solve complex business problems. I like this definition from the Interaction Design Foundation: it’s a way to design our work to “help us systematically extract, teach, learn and apply these human-centered techniques to solve problems in a creative and innovative way – in our designs, in our businesses, in our countries, in our lives.” It sounds pretty broad, I know…but in essence, Design Thinking is a process for creative problem-solving. When using a Design Thinking approach, you work in an iterative way to understand users and redefine problems so you can create an alternative, innovative strategies, and solutions to complex problems where the solution isn’t apparent. It’s both a change in mindset about how to solve for a problem and different process to get to the best and most creative solutions. When should we consider Design Thinking? Superior solutions – asking better questions helps you discover more original and innovative solutions. When you can incorporate users’ input, perspectives & needs, and bring a diverse group of people into the problem-solving process, you have all the ingredients for a better solution & result. In summary, Design Thinking is a fantastic way to actually provide some good structure to drive innovation. And – throughout the process – it generates collaboration, alignment, and engagement with a diverse group of employees who have a voice in shaping the final solution. Sheri Browning is a Partner at PeopleResults. You can reach her at sbrowning@people-results.com or on Twitter @sbPResults.